If you’re new to the sport, there’s a good chance that the title of this question has you squinting somethin’ fierce. Is skydiving like therapy? Why: Yes, it is. It’s exactly like therapy, and it’s great if you’re not a fan of couches and talking until a little timer goes off. If you’re wondering about skydiving-style therapy, why is that? Do you suddenly find yourself in a situation that’s making you question everything about your life? Because if so, you’re certainly not the first person who’s walked onto a dropzone in an elemental state of transition. Here at WSC, we meet customers every day who are looking for a way to reframe a major life challenge — divorce, health diagnosis, loss, a big move, a career or educational change — in an exciting, inspiring new way. For a person who doesn’t know anything about skydiving, it’s easy to imagine that these novelty-seeking guests are skydiving because they “have nothing left to lose.” The truth is almost exactly to the contrary: they’re looking to engage with the process of living their lives and to put their hearts on the table with drama and panache. They’re looking to take charge of their situation. And they’re looking to do something truly incomparable for themselves. In skydiving, they do it all. Fact #2: Skydiving is good for you! We meet loads of therapists who say they’re itching to “prescribe” skydiving. Weird? Not really. 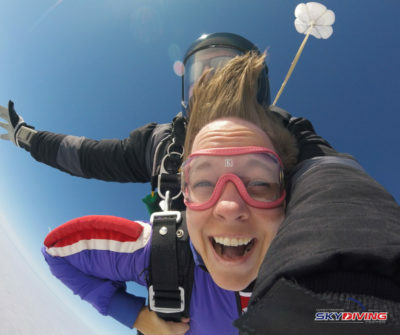 Not only does skydiving feel good in the head and heart – it’s a sport, and it’s good for the body, as well. Often, folks who take up the sport start to take a renewed interest in their strength, their cardio fitness, their flexibility, and their stamina. They start doing breathing exercises. Getting up early to get to the dropzone becomes a new ritual. And they start creating and sustaining fulfilling friendships with the people they meet there. If that sounds like a shopping list of the habits you should pick up in order to promote a healthy lifestyle, you’re absolutely right. And there’s a huge bonus if you do all that in the context of skydiving: You get to throw down some serious moves in freefall, too! Physical and spiritual benefits aside – skydiving is incredibly powerful in the sense of personal empowerment. To leap out above the birds, among the clouds, far above (and most certainly in spite of) the crowd of voices from without and within that spew negativity — why, that’s quite literally like falling in love. Skydiving gets you out of the worries in your head. It’s pure presence. Freefall will show you how powerful you are, and it’ll offer you a peek at just how much out-of-the-box inspiration your one wild and precious life has in store for you. Fact #4: Skydiving is a beautiful addition to any life story. Let us be a part of yours. Sure, we’re not licensed therapists – but our mission here at WSC could be seen as the same. We’re not a glorified roller coaster ride for a passive audience. We want to facilitate you to think, to feel, to leave fear behind and to live your very best life. 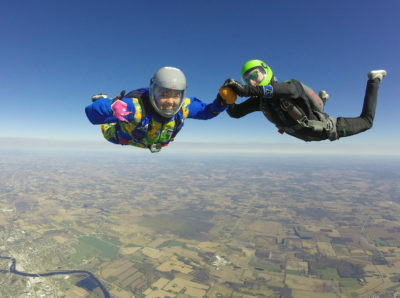 We founded the Wisconsin Skydiving Center to offer our skydivers — new or eminently experienced — a heart-filled, energy-stoking, life-brightening experience. The countless people who have shared our sky with us have found happiness here, and we’re saving some just for you. Join us! Skydiving as a Gift – a Good or Bad Idea?